I'm not sure what the point of Dead in the Family is. As part of the Sookie Stackhouse series it's more of a filler book than any sort of significant addition to the ongoing story arc. As a standalone novel it's pretty much a whole lot of nothing. Although I know something happened in the book's 311 pages, I just can't figure out what. Strangely, it was still a compelling read, but I'm pretty sure that was mainly because my curiosity kept driving me to find out what would happen next. Ultimately I was disappointed. Eric and Sookie are finally in an official relationship but they still hardly spend any time together. I've always found the Eric-Sookie moments to be the most interesting and satisfying parts of these books so it's incredibly frustrating that so little time is spent focusing on those moments. Also, Sookie went from being ambivalent/worried about her connection to Eric (last book) to repeatedly declaring her love for him (this book) without any sort of bridge between the two emotional states. A little more filling in the gaps would have been nice. I've complained in the past that Sookie has to endure one thing after another after another. I'm glad that's not the case here but instead the action in Dead in the Family is so completely underwhelming. Likewise with the mystery portion of the book. By the time you notice and start caring it's all over. I appreciate that Dead in the Family is more about setting the stage for future books than necessarily bombarding the reader with action-filled scenes, but as I was reading, the thought kept popping into my head that Charlaine Harris really phoned this one in. Sookie's character development is also really awkward. She keeps talking about how she's not the same person she once was. The first rule of writing is show don't tell, but it seems Harris would rather tell and tell and keep telling some more without really showing us anything. And am I the only one not buying that Sookie would take an unknown drug just to prove to Alcide that she's still the same person (after he basically guilts her into it, I might add)? It's been how many books and it's still nearly impossible for me to actually empathize with--or really care about--our so-called heroine. The book also suffers from a bunch of lesser irritations. If Charlaine Harris was wondering whether having Sam put on Jace Everett's "Bad Things" (the theme song of True Blood) and having the entire bar sing along would be really cool or really cheesy, someone should tell her it was the latter. Definitely the latter. And although Harris gratefully acknowledges her continuity editors in just about every book, I have yet to read one that doesn't somehow mess up on that issue (I'm not even getting paid and I notice the errors). Also, and this one is particularly annoying on a personal level, the god Zeus is *not* from the Roman system. Zeus is from the Greek pantheon, thank you very much. They can go out of their way to illustrate the correct pronunciation and meaning of Roman names but somehow this glaring mistake was overlooked. I don't think Dead in the Family is the worst book in the Sookie Stackhouse series, but it's also nothing to get excited about. Think of it as a stepping stone to get you to the next book, whenever that comes along. And if you want more Jace Everett in your life, go watch True Blood (or better yet, get the show's soundtrack--highly recommended). Appearance: Very pale humans with long fangs that extend and retract at will. Vampires emit a slight glow, but apparently only Sookie can see it. Strengths: Super strength, speed. Heightened vision and sense of smell. Quick healing. Every vampire seems to have a unique gift/ability. Weaknesses: Stakes, silver, sunlight. The bond between maker and child is often not a welcome one (makers can control their children through it). Mythology: A vampire needs an invitation to enter a private residence, but once a vampire is invited their maker and "siblings" can also enter (Eric's maker and 'brother' can come into Sookie's house even though she doesn't want them there). "You're welcome. Good night, Bobby," I [Sookie] said, and we hung up. We'd managed to have an entire civil conversation. Vampires, bringing America together! 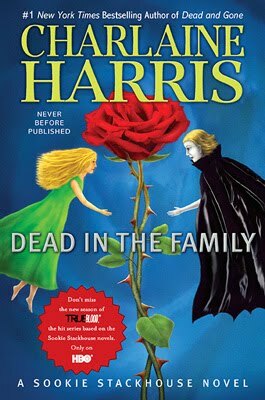 Dead in the Family by Charlaine Harris. From Penguin (Ace Books). Thanks to Bronwyn at Penguin for sending me my review copy.